Questioned by journalists, the Vatican Secretary of State, Cardinal Parolin confirmed that Asia Bibi and her family is on her own. He said, “It’s an internal question that regards Pakistan, I hope it will be resolved in the best ways possible.” Then he added that the Vatican loves refugees but not of the icky Catholic variety and certainly not anywhere near the Vatican. OK, I made up the last part but they really did turn their backs on her. I can't imagine a more reprehensible response. I know some people are going to say that those comments belie a flurry of activity behind the scenes that they don't want to endanger with talk in the press. Because we all know how careful Pope Francis is in talking to the press, right? For a little background Bibi, who is a Catholic, is one of very few Christians in her Pakistani village which is predominantly Muslim. She has five children and worked as a farmhand. After drinking from a cup in 2009, she was berated by a neighbor that it was forbidden for a Christian to drink water from the same utensil from which Muslims drink. She was told that she was considered unclean because she's a Christian. 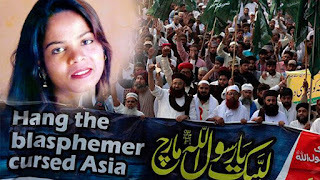 Neighbors then demanded that she convert to Islam, to which she responded, "I believe in my religion and in Jesus Christ, who died on the cross for the sins of mankind. What did your Prophet Mohammed ever do to save mankind? And why should it be me that converts instead of you?" She was sentenced to death by hanging but after many calls from the world to act...uhm...not quite so barbaric, she was found not guilty on appeal recently. Yay, right? But insert Muslim outrage here. They freaked. And now many adherents of the religion of peace are promising to kill her. And now the government says she's not allowed to leave the country. So, as you might imagine, things look pretty dire. To be clear, millions of people want to kill her and her family and she's not allowed to leave. Uhm, how do we think this is going to end? So...now the Vatican heroically stands up and says, "You're on your own. good luck!" Ugh. I haven't seen this much spinelessness since Pope Francis "negotiated" with China. But at least now, the Vatican can get back to important issues like climate change and scolding Europe and the U.S. to take in more refugees. This Pope has a mission to save humanity, but can't be bothered with a single human. He cares about Islam, Allah, Gaia. He does not care about (dare I say dislikes) Catholics, Tradition, Heaven. My bishop doesn't much care for Catholics either. And the anti-death-penalty pope is has begun a love affair with China, the world's foremost practicioner of the death penalty. The Vatican has thrown persecuted Christians around the world under the bus. But they have time to back climate change and the U.N. goals. What a shame.